"Tens" ? Click it and see what you think. WASHINGTON — Tens of thousands of people rallied at the steps of the Lincoln Memorial on Saturday, summoned by Glenn Beck, a conservative broadcaster who called for a religious rebirth in America at the site where the Rev. Dr. Martin Luther King Jr. delivered his famous “I Have a Dream” speech 47 years ago to the day. Across town, several hundred people packed a football field at Paul Laurence Dunbar High School to stage a rally commemorating Dr. King’s “I Have a Dream” speech. With a football field containing some 5,000 square yards hundreds of people have to feel very crowded, doncha know? Sharpton and the others of his ilk have to know the sun set on their day. They won't go with a whimper. Look around the other MSM schlock peddlers and the NYT looks pretty good. Most immediately jump on the "coincidence" issue of MLK's speech anniversary; the Times spares us this revelation until Page 2. Photos showing the crowds- which is what set me off searching after seeing the excellent pix on AD- are seldom provided. Even HuffPo delivered better than ABC, CNN, or BBC. The headline for the BBC entry? Some call it the "Dead Island". I prefer the "Undead Island". You know, if each side of the reflecting pool holds 125,000, then the field on the left looks like it holds about 3 times that conservativley--and that's also without counting the people who may be hidden under the trees. Assuming that there are, say, half of that number on the right, hidden by trees, maybe the estimate really is closer to 1 million. (!!??) Wow. However many people attended, however, I think Beck has succeeded in driving a stake through the Left's heart. I continue to marvel at the death wish of the MSM. Half a million people went home, turned on the teevee, and heard things that they know from personal experience are a pack of lies. The leftoids from Sharpton's group are delighted; the folks from the Restoring Honor rally are disgusted; but that doesn't matter -- both of them know the media are lying. It's supposed to be news, that is, information. How likely are that half-million to turn to the MSM next time for information? How many relatives, friends, and neighbors did they tell? How much will an ad block on MSNBC go for tomorrow? Ric - the greatest thing was that all of those people have realized that they are not alone. That is where the rally starts, when the broken troops coalesce onto one another, and start heading back to the sound of the guns. No real direction, no officers, no orders. Just go back and make them know that they have been in a heckuva fight. "With malice toward none; with charity for all; with firmness in the right, as God gives us to see the right, let us strive on to finish the work we are in; to bind up the nation's wounds; to care for him who shall have borne the battle, and for his widow, and his orphan—to do all which may achieve and cherish a just and lasting peace, among ourselves, and with all nations." The media has been fudging with the numbers since the huge pro-life rally from 1993. They tried to minimize the crowds then, and they're still playing from the same book now. Only difference is the alternative media is on top of them now, and they are so over. 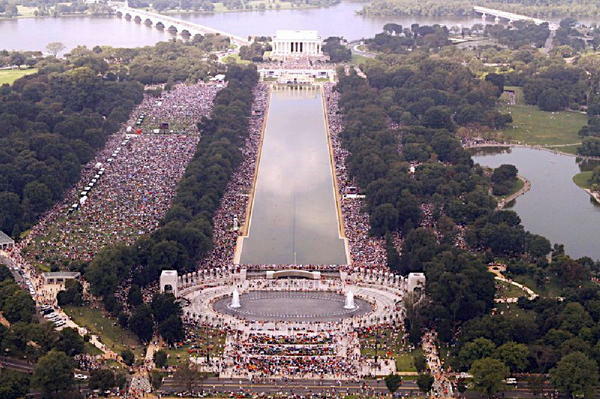 Somewhere I was reading the National Park Service stopped counting crowds after the back-n-forth arguing that took place following the Million Man March in 1995. I suppose it's better to have a government afraid of its people than vice-versa, but it's always a bad thing to abandon reality in service of soothing opportunistic tirades. This is probably why all the silly numbers are being thrown around. "However many people attended, however, I think Beck has succeeded in driving a stake through the Left's heart." Why so optimistic, ahem? If the 20th century didn't destroy the Left, I seriously doubt Glenn Beck can. The Left is the living dead. It is bloodthirsty for conservative destruction (it knows its real enemy, unlike conservatives); it's relentless in pursuing its prey; it's comprised of bloodsucking looters and moochers; it's a death cult. And the adherents can't begin to see themselves in a mirror. Vampires. It's going to take more than a rally. Much more... like the Second Coming?